I enjoy getting the newsletters from BarleyWine in Copenhagen. This is a no nonsense beer shop that has been around for a number of years, before all things beery became hip or trendy. The shop owner Jan Filipe does not only introduce his new beers, he also has some words of advice for his customers. He was the one who held back his stock of the Nøgne Ø Dark Horizon 2 until he felt it had reached a proper maturity for drinking. His recent mail raises the issue of neophilia. This conditions was coined by the (highly recommended) writer Robert Anton Wilson, but it is highly apropriate as a diagnosis for a large number of beer geeks. Whenever we enter a beer shop or bar, the question is always What’s new? Jan Filipe points out that he is surprised, and slightly disappointed, almost every day when he recommends a beer and gets the response I’ve already tasted that one. 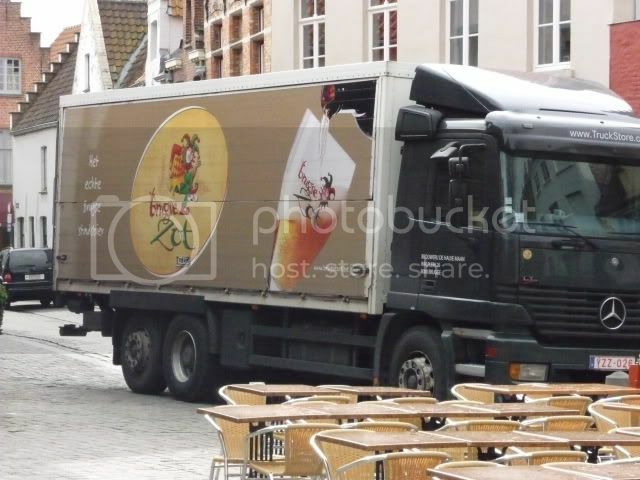 When he gets this answer he envisages the millions of passionate beer drinkers in Germany, Austria, The Czech Republic, Poland, Ireland and the UK, who every day talks about nuances of the same beer they have enjoyed for 10, 20 or 30 years. He also points out that for micro brews, separate batches of the same beer might be very different. The same label might contain very different brews. I have to admit I am quite guilty of what he describes. But I have to say that with the better access to world class beers we now enjoy here in Norway, I tend more often to order something I have enjoyed before. At the end of the day it’s a matter of balance, isn’t it? 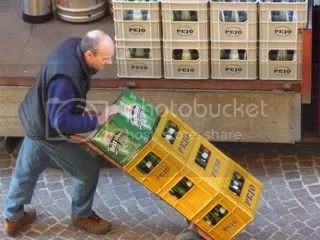 I don’t go out of my way to get another new pale lager any more. But there is the thrill of the new sensations, too. And there wouldn’t be much to blog about if I stuck the same beer for decades. 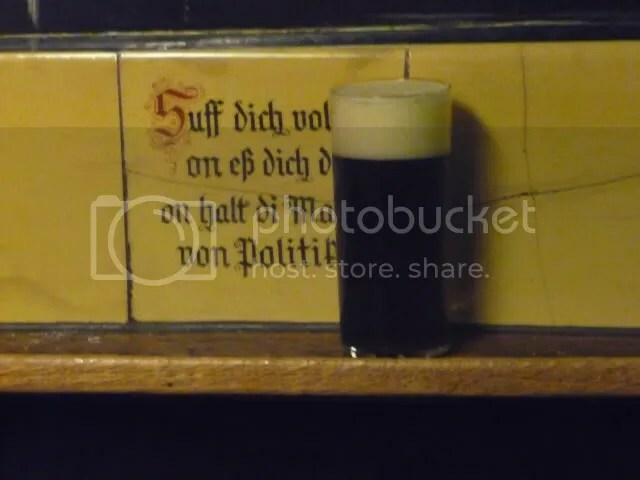 Some years ago I was asked by a regular in a somewhat seedy Berlin Kneipe why I took a photo of a glass of beer. When I tried in my rather rusty German to explain the concept of a beer blog, he looked at me with the pity usually reserved for the mildly retarded. The first Beer Symposium for Beer Enjoyment and Brewery Culture (it looks more impressive in German) takes place in Bamberg in October. 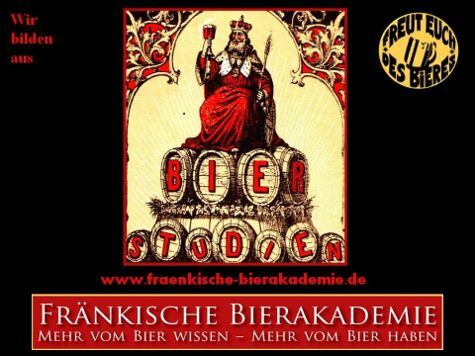 This is organised by the Franconian Beer Academy, and has a varied program, including brewery visits, discussions on beer tourism, brew pubs, marketing and brewing. A praticularly interesting session will probably be the one on the revival of the Leipzig beer style Gose. A participation fee of 249 Euros should not ruin anyone, and that includes a number of meals as well as Pausengetränke – drinks during the breaks. I have to admit I haven’t been to Bamberg, but I doubt I can fit this into my agenda this year. I hope this can become a regular event, I welcome beer events that go beyond beer festivals or trade fairs and put beer and brewing into the proper historical and cultural context. I like to think of beer writing as closely related to food writing, while many food writers probably think of beer writing as the slightly retarded cousin of the family. Those days I hardly have the time to read the beer blogs I would have liked to keep up with, meaning I miss out on much food journalism that is probably worth reading. 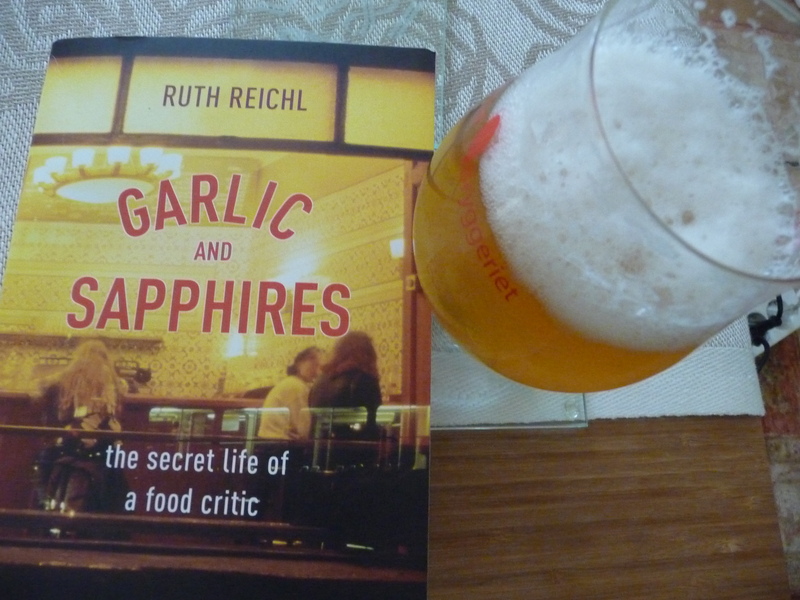 I am currently reading Garlic and Sapphires by Ruth Reichl, which I more or less stumbled over. Not a drop of beer is mentioned in the book by the former New York Times restaurant critic, but it certainly has other qualities. The hype here is how she developed clever disguises to avoid being detected in the restaurants she visited, but these parts get boring after a while, even if they confirm that critics get the celebrity treatment. The unflattering portraits of other staff at the NYT do not interest me very much either. I forgot everything but what was going on in my mouth, the fish doing a little tango with crunchy strips of artichoke. The softness of the fish was sandwiched between layers of crunch – the artichoke at the bottom, bread crumbs on top, the flavours appearing and vanishing in a maddening way. I thought I tasted chestnut, but then it was gone, absorbed into the deep musky flavour of the wine. I even learned something new. When reading the description of the perfect hash browns, I suddenly realized what it’s all about. It’s the Central European Rösti. After the Easter break, there are a number of beer events crammed in over a few weeks. Two beer festivals in Copenhagen during the same week in May. The Association of Small Swedish Breweries arrange the event Big Beers, Small Breweries next weekend, surely something worth attending. Come to think of it, I have never been to any of the Swedish beer festivals, big or small. Today there is the launch of new beer import company Beer Enthusiast her in Oslo, promising 20 beers new to the Norwegian market. Breweries like St Austell, Midtfyns Bryghus, Sundbytunet and Bryggeriet Skands will be present, with additional beers from Baladin, Kinn, Sierra Nevada and Hornbeer. I think I’ll pass the Norwegian cask festival during the weekend. There is the Haandbryggeriet festival in two weeks time, too. And there is a box from myBreweryTap at the Post Office. I fished these two beers out of my box of Bavarian Lent beers just before we left for our Easter break in the Norwegian mountains. Some enthusiasts had managed to make a short ski track on Sunday, but by now the skiing season is over. Dry frost means pleasant hiking anyway, and I also had to spend some tme removing the last of the sticky ski wax. So I felt I had earned the refreshement in these two bottles, one lovely red/brown, one pale. The Stein-bock is from the Sclossbrauerei Stein, a classic Bock with walnuts, lots of grain and just the right bittersweet balance. 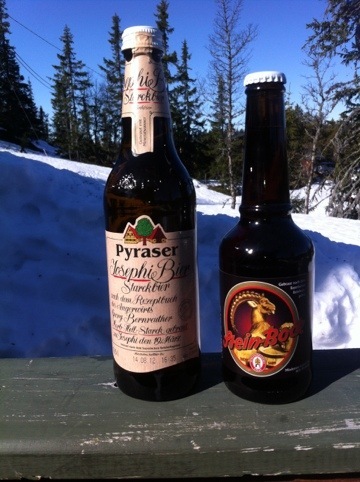 The Josephi from Pyraser is a pale Bock, brewed once a year on 19 March. I assume this is fresh from the brewery. Cereals, fine use of aromatic and bitter Central European hops. I’d think beers like these would make the sacrifices of lent much more bearable. Might be old news to some of you, but these Belgian stamps featuring Trappist beers have just reached my attention. Lovely. If more countries follow up, I’ll have to start collecting again.